Download "Carter Clark Financial Recovery"
4 1. INTRODUCTION 1.1 General This guide has been produced to help members of liquidation committees to be aware of: the duties and functions of the committee their rights as members of the committee the procedural rules relating to committee business This introduction gives a brief explanation of the liquidation procedure, and summarises the principal functions of the committee and the liquidator s main duties in relation to it. Detailed provisions are set out in the remaining sections of the guide The margin references are to the Insolvency Act 1986, the Insolvency Rules 1986 (as amended), the Insolvency Practitioners Regulations 2005, the Insolvency Regulations 1994, and Statements of Insolvency Practice 9 and 15 issued to all authorised insolvency practitioners. 1.2 Liquidation Liquidation (also termed winding up ) is the formal winding up of a company s affairs, entailing the realisation of its assets and the distribution of the proceeds in a prescribed order of priority. Liquidation may be either compulsory, when it is instituted by order of the court, or voluntary, when it is instituted by resolution of the shareholders. An insolvent voluntary liquidation is known as a creditors voluntary liquidation because its conduct is primarily under the control of the creditors. A solvent voluntary liquidation is known as a members voluntary liquidation, because its conduct is primarily under the control of its members. Members voluntary liquidations are not covered further in this guidance as there is no committee in such proceedings The guidance which follows applies to both compulsory liquidations and creditors voluntary liquidations unless otherwise indicated. 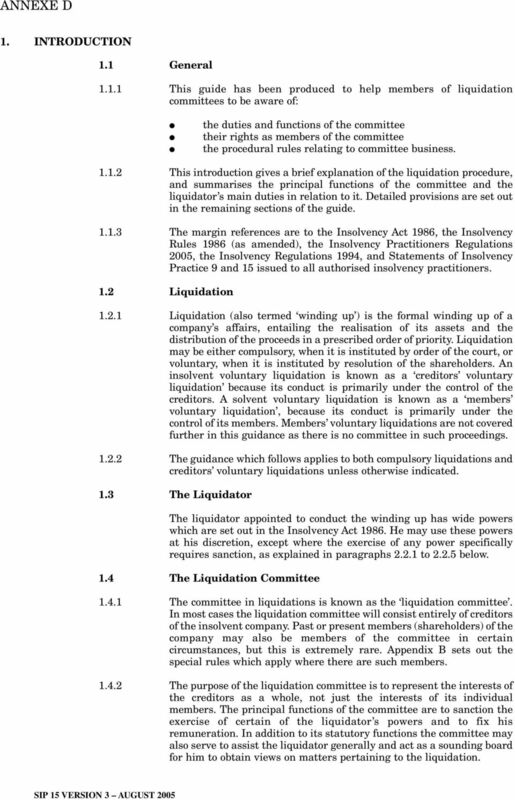 1.3 The Liquidator The liquidator appointed to conduct the winding up has wide powers which are set out in the Insolvency Act He may use these powers at his discretion, except where the exercise of any power specifically requires sanction, as explained in paragraphs to below. 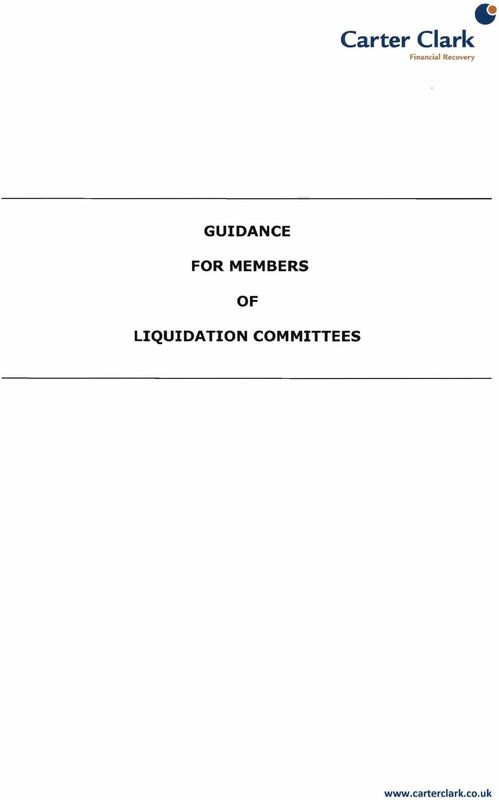 1.4 The Liquidation Committee The committee in liquidations is known as the liquidation committee. In most cases the liquidation committee will consist entirely of creditors of the insolvent company. Past or present members (shareholders) of the company may also be members of the committee in certain circumstances, but this is extremely rare. 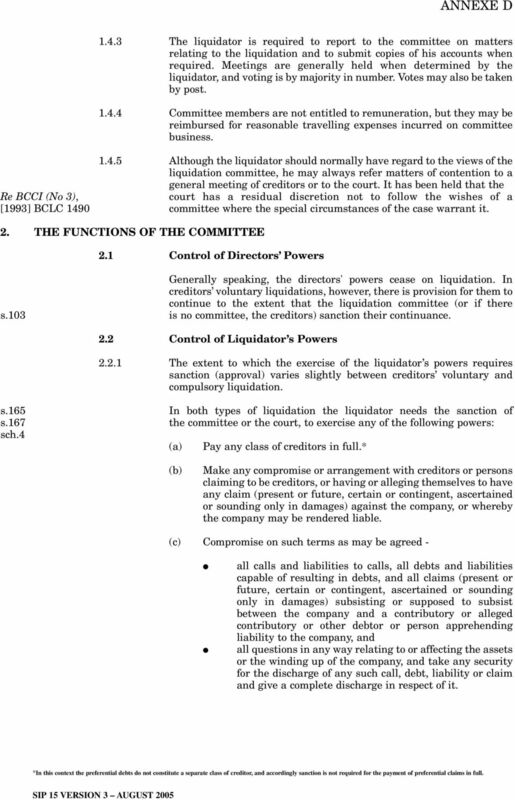 Appendix B sets out the special rules which apply where there are such members The purpose of the liquidation committee is to represent the interests of the creditors as a whole, not just the interests of its individual members. The principal functions of the committee are to sanction the exercise of certain of the liquidator s powers and to fix his remuneration. In addition to its statutory functions the committee may also serve to assist the liquidator generally and act as a sounding board for him to obtain views on matters pertaining to the liquidation. 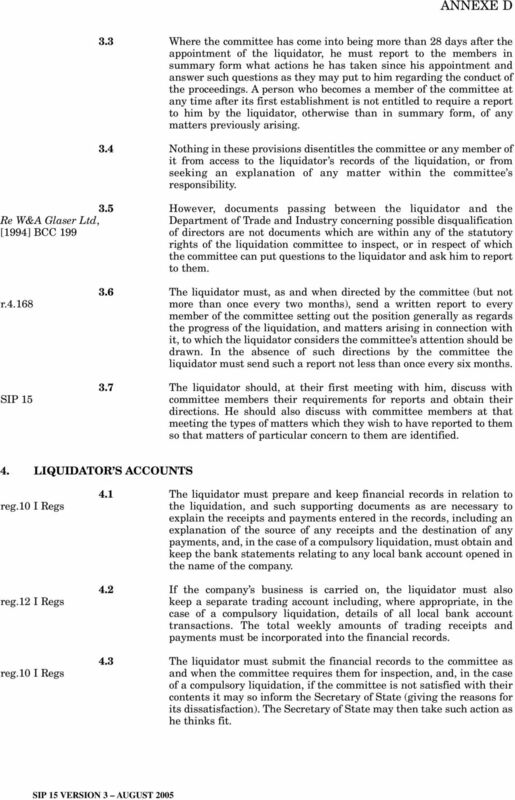 5 1.4.3 The liquidator is required to report to the committee on matters relating to the liquidation and to submit copies of his accounts when required. Meetings are generally held when determined by the liquidator, and voting is by majority in number. 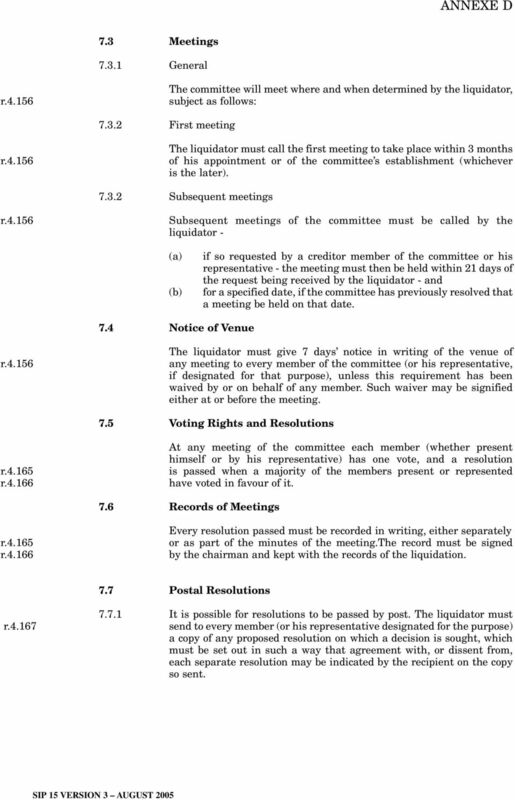 Votes may also be taken by post Committee members are not entitled to remuneration, but they may be reimbursed for reasonable travelling expenses incurred on committee business Although the liquidator should normally have regard to the views of the liquidation committee, he may always refer matters of contention to a general meeting of creditors or to the court. It has been held that the Re BCCI (No 3), court has a residual discretion not to follow the wishes of a  BCLC 1490 committee where the special circumstances of the case warrant it. 2. THE FUNCTIONS OF THE COMMITTEE 2.1 Control of Directors Powers Generally speaking, the directors' powers cease on liquidation. In creditors voluntary liquidations, however, there is provision for them to continue to the extent that the liquidation committee (or if there s.103 is no committee, the creditors) sanction their continuance. 2.2 Control of Liquidator s Powers The extent to which the exercise of the liquidator s powers requires sanction (approval) varies slightly between creditors voluntary and compulsory liquidation. s.165 In both types of liquidation the liquidator needs the sanction of s.167 the committee or the court, to exercise any of the following powers: sch.4 (a) Pay any class of creditors in full. * (b) Make any compromise or arrangement with creditors or persons claiming to be creditors, or having or alleging themselves to have any claim (present or future, certain or contingent, ascertained or sounding only in damages) against the company, or whereby the company may be rendered liable. (c) Compromise on such terms as may be agreed - all calls and liabilities to calls, all debts and liabilities capable of resulting in debts, and all claims (present or future, certain or contingent, ascertained or sounding only in damages) subsisting or supposed to subsist between the company and a contributory or alleged contributory or other debtor or person apprehending liability to the company, and all questions in any way relating to or affecting the assets or the winding up of the company, and take any security for the discharge of any such call, debt, liability or claim and give a complete discharge in respect of it. *In this context the preferential debts do not constitute a separate class of creditor, and accordingly sanction is not required for the payment of preferential claims in full. 7 a special resolution of the company conferring appropriate authority on the liquidator, and the sanction of the liquidation committee or the court. 2.4 Acts requiring Notice to the Committee Where the liquidator - s.165(6) (a) disposes of any property of the company to a person who is s.167(2) connected with the company, or (b) in the case of a compulsory liquidation, employs a solicitor, he must give notice to the committee of that exercise of his powers. 2.5 Expenses of Preparing Statement of Affairs and Convening Creditors Meeting r.4.38 r.4.62 In a creditors voluntary liquidation, any reasonable and necessary expenses of preparing the statement of affairs and convening the creditors meeting held under section 98 of the Insolvency Act may be paid out of the company s assets as an expense of the liquidation. 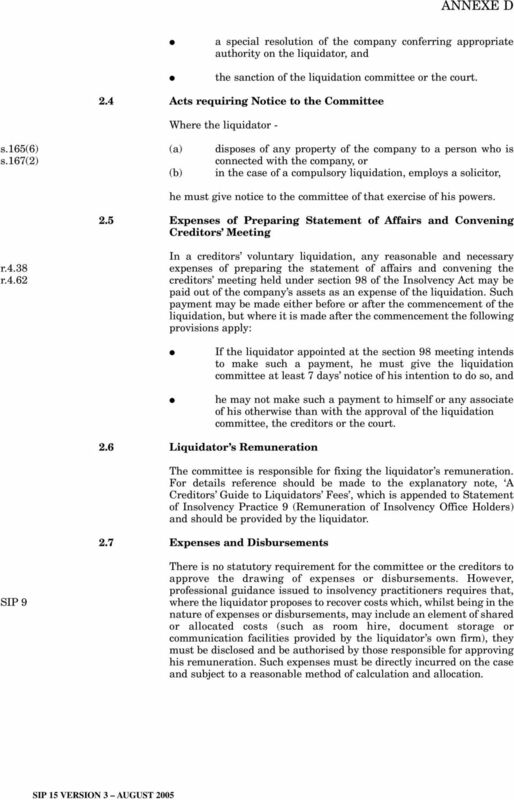 Such payment may be made either before or after the commencement of the liquidation, but where it is made after the commencement the following provisions apply: If the liquidator appointed at the section 98 meeting intends to make such a payment, he must give the liquidation committee at least 7 days notice of his intention to do so, and he may not make such a payment to himself or any associate of his otherwise than with the approval of the liquidation committee, the creditors or the court. 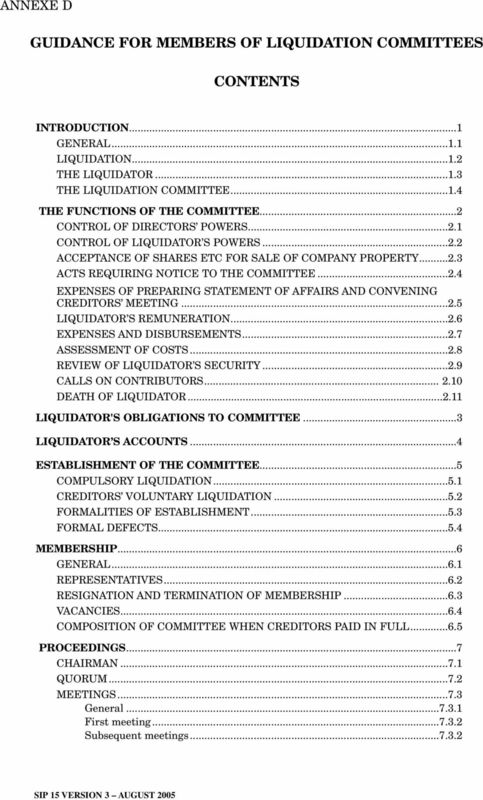 2.6 Liquidator s Remuneration The committee is responsible for fixing the liquidator s remuneration. For details reference should be made to the explanatory note, A Creditors Guide to Liquidators Fees, which is appended to Statement of Insolvency Practice 9 (Remuneration of Insolvency Office Holders) and should be provided by the liquidator. 2.7 Expenses and Disbursements SIP 9 There is no statutory requirement for the committee or the creditors to approve the drawing of expenses or disbursements. However, professional guidance issued to insolvency practitioners requires that, where the liquidator proposes to recover costs which, whilst being in the nature of expenses or disbursements, may include an element of shared or allocated costs (such as room hire, document storage or communication facilities provided by the liquidator s own firm), they must be disclosed and be authorised by those responsible for approving his remuneration. Such expenses must be directly incurred on the case and subject to a reasonable method of calculation and allocation. 8 2.8 Court Assessment of Costs r Where any costs, charges or expenses are payable out of the assets (for example agent s or legal fees), the liquidator may agree them with the person entitled to payment. However, if the committee resolves that any such costs, charges or expenses should be determined by the court, the liquidator must require the person entitled to payment to deliver his bill of costs for assessment Where such costs, charges or expenses are to be assessed, this does not preclude the liquidator from making payments on account against an undertaking from the payee to repay any amount which proves, on assessment, to have been overpaid. 2.9 Review of Liquidator s Security r.12.8 The liquidator is required to have in place security for the proper performance of his functions (see Appendix A). 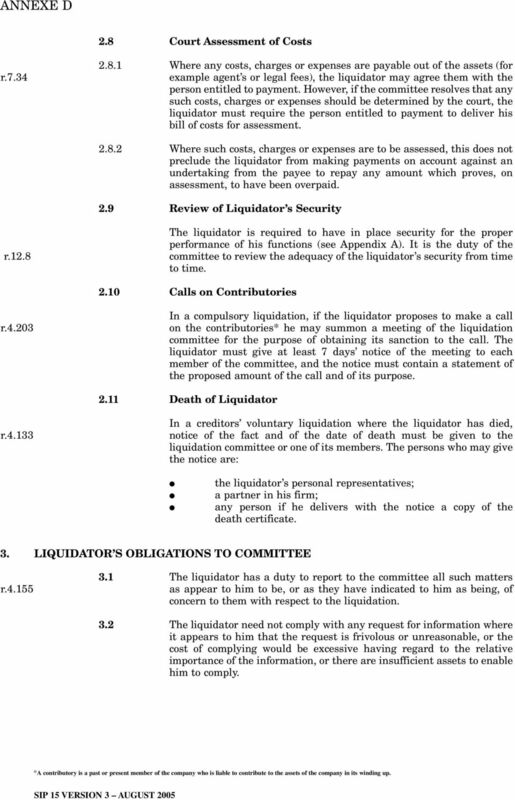 It is the duty of the committee to review the adequacy of the liquidator s security from time to time Calls on Contributories r In a compulsory liquidation, if the liquidator proposes to make a call on the contributories* he may summon a meeting of the liquidation committee for the purpose of obtaining its sanction to the call. 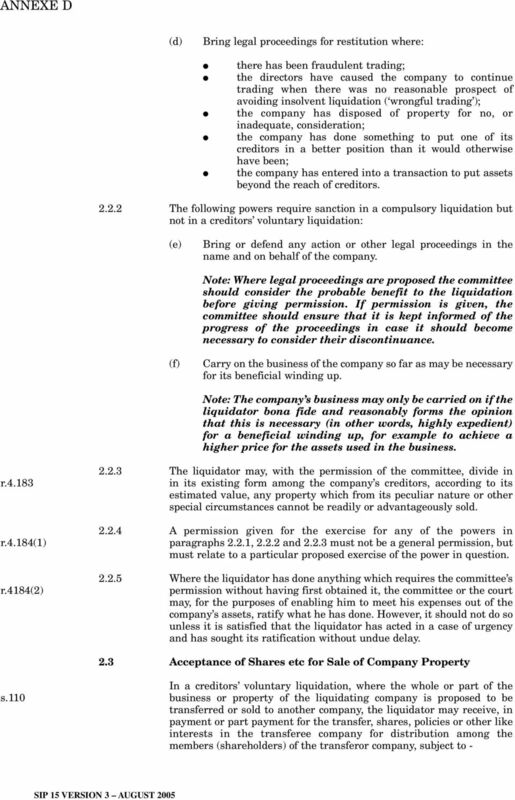 The liquidator must give at least 7 days notice of the meeting to each member of the committee, and the notice must contain a statement of the proposed amount of the call and of its purpose Death of Liquidator r In a creditors voluntary liquidation where the liquidator has died, notice of the fact and of the date of death must be given to the liquidation committee or one of its members. The persons who may give the notice are: the liquidator s personal representatives; a partner in his firm; any person if he delivers with the notice a copy of the death certificate. 3. LIQUIDATOR S OBLIGATIONS TO COMMITTEE r The liquidator has a duty to report to the committee all such matters as appear to him to be, or as they have indicated to him as being, of concern to them with respect to the liquidation. 3.2 The liquidator need not comply with any request for information where it appears to him that the request is frivolous or unreasonable, or the cost of complying would be excessive having regard to the relative importance of the information, or there are insufficient assets to enable him to comply. *A contributory is a past or present member of the company who is liable to contribute to the assets of the company in its winding up. 9 3.3 Where the committee has come into being more than 28 days after the appointment of the liquidator, he must report to the members in summary form what actions he has taken since his appointment and answer such questions as they may put to him regarding the conduct of the proceedings. A person who becomes a member of the committee at any time after its first establishment is not entitled to require a report to him by the liquidator, otherwise than in summary form, of any matters previously arising. 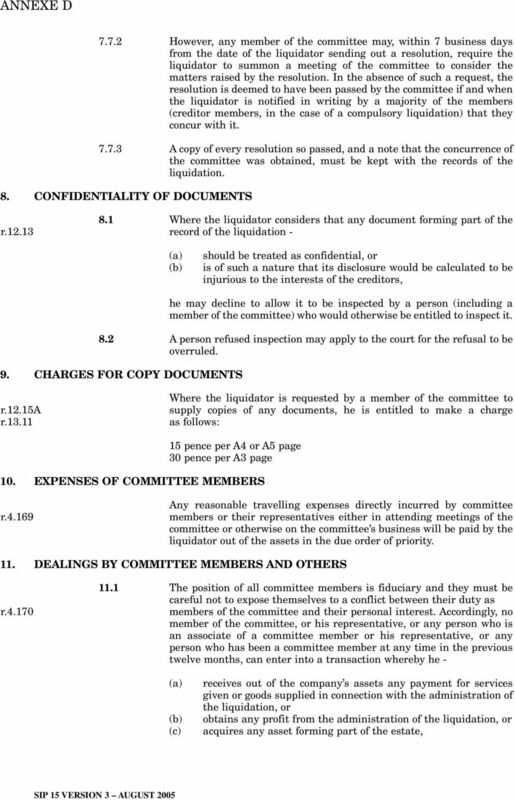 3.4 Nothing in these provisions disentitles the committee or any member of it from access to the liquidator s records of the liquidation, or from seeking an explanation of any matter within the committee s responsibility. 3.5 However, documents passing between the liquidator and the Re W&A Glaser Ltd, Department of Trade and Industry concerning possible disqualification  BCC 199 of directors are not documents which are within any of the statutory rights of the liquidation committee to inspect, or in respect of which the committee can put questions to the liquidator and ask him to report to them. r SIP The liquidator must, as and when directed by the committee (but not more than once every two months), send a written report to every member of the committee setting out the position generally as regards the progress of the liquidation, and matters arising in connection with it, to which the liquidator considers the committee s attention should be drawn. In the absence of such directions by the committee the liquidator must send such a report not less than once every six months. 3.7 The liquidator should, at their first meeting with him, discuss with committee members their requirements for reports and obtain their directions. He should also discuss with committee members at that meeting the types of matters which they wish to have reported to them so that matters of particular concern to them are identified. 4. LIQUIDATOR S ACCOUNTS reg.10 I Regs reg.12 I Regs reg.10 I Regs 4.1 The liquidator must prepare and keep financial records in relation to the liquidation, and such supporting documents as are necessary to explain the receipts and payments entered in the records, including an explanation of the source of any receipts and the destination of any payments, and, in the case of a compulsory liquidation, must obtain and keep the bank statements relating to any local bank account opened in the name of the company. 4.2 If the company s business is carried on, the liquidator must also keep a separate trading account including, where appropriate, in the case of a compulsory liquidation, details of all local bank account transactions. The total weekly amounts of trading receipts and payments must be incorporated into the financial records. 4.3 The liquidator must submit the financial records to the committee as and when the committee requires them for inspection, and, in the case of a compulsory liquidation, if the committee is not satisfied with their contents it may so inform the Secretary of State (giving the reasons for its dissatisfaction). The Secretary of State may then take such action as he thinks fit. 10 5. ESTABLISHMENT OF THE COMMITTEE 5.1 Compulsory Liquidation In a compulsory liquidation not preceded by an administration s.141 the committee will be established by general meetings of the company s creditors and contributories. * The committee must consist of at least r three, and not more than five, creditors, and in cases where the winding up is on grounds other than insolvency it may also have up to three contributory members. r r Where the winding-up order is made immediately on the discharge of an administration order and the court orders that the person acting as administrator be appointed liquidator, then any committee established for the purposes of the administration continues in being as the liquidation committee and there is no need to establish another committee. However, this provision does not apply if the number of members at the date of the winding-up order is less than three. Furthermore, any creditor who was a member of the committee immediately before the winding-up order ceases to be a member if his debt is fully secured. Where the winding-up order is made on grounds other than insolvency, the liquidator must convene a meeting of contributories to give them the opportunity to appoint contributory members of the committee Creditors voluntary liquidation In a creditors voluntary liquidation the creditors in general meeting s.101 may appoint a committee of not more than five persons. If such a committee is appointed, the shareholders of the company may in general meeting appoint up to a further five persons to the committee. The creditors may, however, resolve to exclude any of the shareholders nominees from the committee unless the court directs otherwise. The court may appoint someone other than the rejected nominee to the committee in his stead. The minimum number of members of the r committee is three. Sch B1, para 83 Where a creditors voluntary liquidation is immediately preceded by an administration, any creditors committee in the administration will become the liquidation committee. 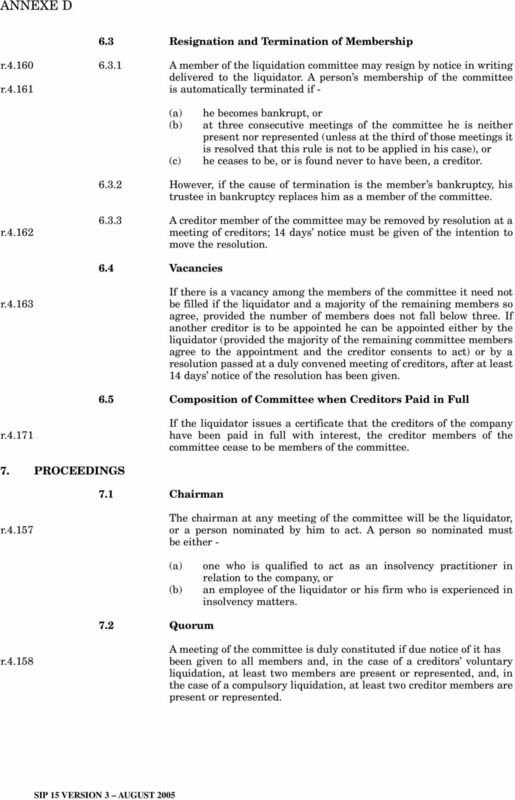 5.3 Formalities of Establishment r The committee does not come into being, and accordingly cannot act, until the liquidator has issued a certificate of its due constitution The liquidator will not issue the certificate until the minimum number of persons required to be members of the committee have agreed to act. Such agreement may be given by the creditor s proxy-holder or representative under section 375 of the Companies Act 1985 present at the meeting establishing the committee, unless the proxy or authorisation specifically precludes such agreement being given. 5.4 Formal Defects r.4.172a The acts of the committee are valid not withstanding any defect in the appointment, election or qualifications of any committee member or the representative of any committee member, or in the formalities of its establishment. *A contributory is a past or present member of the company who is liable to contribute to the assets of the company in its winding up. 11 6. 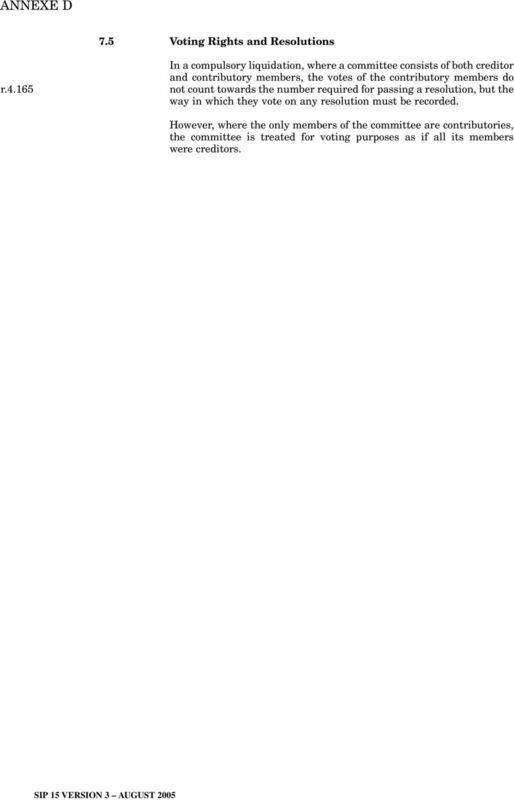 MEMBERSHIP 6.1 General r.4.152(5) It is the creditors or contributories themselves who are the members of the committee, not the individuals who represent them. Thus a company which is a creditor may be a member of the committee but can only act through a epresentative appointed in accordance with paragraphs to below Any creditor (other than one whose debt is fully secured) may be a r member of the committee, so long as - (a) (b) (c) he has lodged a proof of his debt, his proof has neither been wholly disallowed for voting purposes nor wholly rejected for the purposes of distribution or dividend, and he has agreed to act as a member of the committee. No person may be a member as both a creditor and a contributory If the company being wound up is a recognised bank, a representative of the Deposit Protection Board may exercise the right to be a member of the committee. If the company is a financial institution, representatives of the Financial Services Authority and the Financial Services Compensation Scheme may exercise the right to be members of the committee. Persons who exercise this right are to be regarded as additional creditor members of the committee. 6.2 Representatives r A member of the committee may be represented by another person duly authorised by him. Such representative must hold a letter of authority entitling him so to act (either generally or specially) signed by or on behalf of the committee member, and for this purpose any proxy or any authorisation under section 375 of the Companies Act 1985 in relation to any meeting of creditors of the company shall, unless it contains a statement to the contrary, be treated as such a letter of authority to act generally signed by or on behalf of the committee member. The chairman at any meeting of the committee may call on a person claiming to act as a committee member s representative to produce his letter of authority, and may exclude him if it appears that his authority is deficient No member may be represented by - a body corporate, an undischarged bankrupt, a person who is subject to a bankruptcy restrictions order or undertaking, or a disqualified director No person may act as representative of more than one committee member, or both as a member and as a representative of another member, on the same committee Where the representative of a committee member signs any document on the member s behalf, the fact that he so signs must be stated below his signature. 12 6.3 Resignation and Termination of Membership r A member of the liquidation committee may resign by notice in writing delivered to the liquidator. 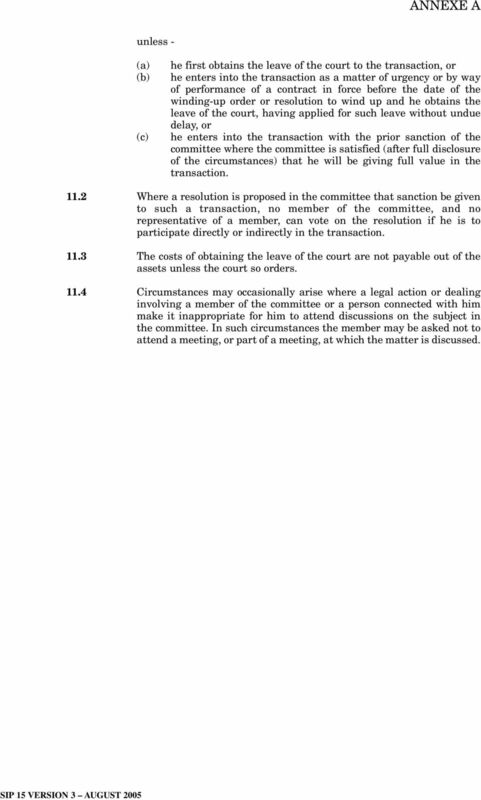 A person s membership of the committee r is automatically terminated if - (a) (b) (c) he becomes bankrupt, or at three consecutive meetings of the committee he is neither present nor represented (unless at the third of those meetings it is resolved that this rule is not to be applied in his case), or he ceases to be, or is found never to have been, a creditor However, if the cause of termination is the member s bankruptcy, his trustee in bankruptcy replaces him as a member of the committee. r A creditor member of the committee may be removed by resolution at a meeting of creditors; 14 days notice must be given of the intention to move the resolution. 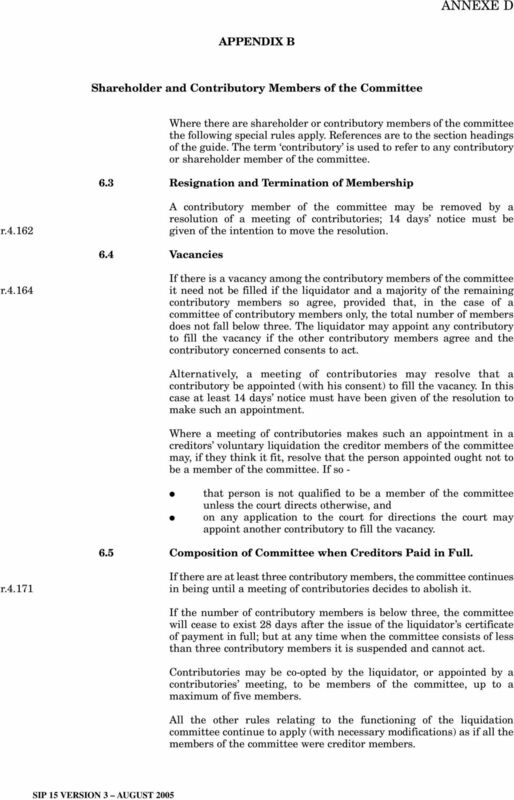 6.4 Vacancies r If there is a vacancy among the members of the committee it need not be filled if the liquidator and a majority of the remaining members so agree, provided the number of members does not fall below three. If another creditor is to be appointed he can be appointed either by the liquidator (provided the majority of the remaining committee members agree to the appointment and the creditor consents to act) or by a resolution passed at a duly convened meeting of creditors, after at least 14 days notice of the resolution has been given. 6.5 Composition of Committee when Creditors Paid in Full r If the liquidator issues a certificate that the creditors of the company have been paid in full with interest, the creditor members of the committee cease to be members of the committee. 7. PROCEEDINGS 7.1 Chairman r The chairman at any meeting of the committee will be the liquidator, or a person nominated by him to act. A person so nominated must be either - (a) (b) one who is qualified to act as an insolvency practitioner in relation to the company, or an employee of the liquidator or his firm who is experienced in insolvency matters. 7.2 Quorum r A meeting of the committee is duly constituted if due notice of it has been given to all members and, in the case of a creditors voluntary liquidation, at least two members are present or represented, and, in the case of a compulsory liquidation, at least two creditor members are present or represented. 13 7.3 Meetings General r The committee will meet where and when determined by the liquidator, subject as follows: First meeting r The liquidator must call the first meeting to take place within 3 months of his appointment or of the committee s establishment (whichever is the later) Subsequent meetings r Subsequent meetings of the committee must be called by the liquidator - (a) (b) if so requested by a creditor member of the committee or his representative - the meeting must then be held within 21 days of the request being received by the liquidator - and for a specified date, if the committee has previously resolved that a meeting be held on that date. 7.4 Notice of Venue r The liquidator must give 7 days notice in writing of the venue of any meeting to every member of the committee (or his representative, if designated for that purpose), unless this requirement has been waived by or on behalf of any member. Such waiver may be signified either at or before the meeting. 7.5 Voting Rights and Resolutions r r At any meeting of the committee each member (whether present himself or by his representative) has one vote, and a resolution is passed when a majority of the members present or represented have voted in favour of it. 7.6 Records of Meetings r r Every resolution passed must be recorded in writing, either separately or as part of the minutes of the meeting.the record must be signed by the chairman and kept with the records of the liquidation. 7.7 Postal Resolutions r It is possible for resolutions to be passed by post. The liquidator must send to every member (or his representative designated for the purpose) a copy of any proposed resolution on which a decision is sought, which must be set out in such a way that agreement with, or dissent from, each separate resolution may be indicated by the recipient on the copy so sent. 15 ANNEXE A unless - (a) (b) (c) he first obtains the leave of the court to the transaction, or he enters into the transaction as a matter of urgency or by way of performance of a contract in force before the date of the winding-up order or resolution to wind up and he obtains the leave of the court, having applied for such leave without undue delay, or he enters into the transaction with the prior sanction of the committee where the committee is satisfied (after full disclosure of the circumstances) that he will be giving full value in the transaction Where a resolution is proposed in the committee that sanction be given to such a transaction, no member of the committee, and no representative of a member, can vote on the resolution if he is to participate directly or indirectly in the transaction The costs of obtaining the leave of the court are not payable out of the assets unless the court so orders Circumstances may occasionally arise where a legal action or dealing involving a member of the committee or a person connected with him make it inappropriate for him to attend discussions on the subject in the committee. In such circumstances the member may be asked not to attend a meeting, or part of a meeting, at which the matter is discussed. 16 APPENDIX A Liquidator s Security The liquidator is required to have in place security for the proper s.390(3) performance of his functions. The security takes the form of reg.12& sch 2, IP Regs a bond which provides that - a surety undertakes to be jointly and severally liable with the liquidator for losses caused by the fraud or dishonesty of the liquidator whether acting alone or in collusion with one or more persons, or the fraud or dishonesty of any person committed with the connivance of the liquidator; the liability of the surety and the liquidator is to be in both a general penalty sum and a specific penalty sum in respect of the individual case; any claims are to be paid first out of the specific penalty sum, then, if that is insufficient, out of the general penalty sum; a cover schedule containing the name of the insolvent and the value of the insolvent s assets is to be submitted to the surety within a specified period. 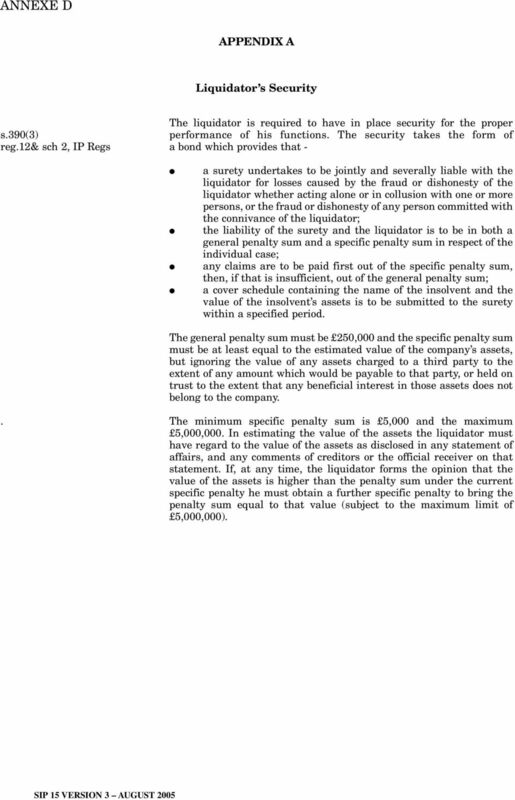 The general penalty sum must be 250,000 and the specific penalty sum must be at least equal to the estimated value of the company s assets, but ignoring the value of any assets charged to a third party to the extent of any amount which would be payable to that party, or held on trust to the extent that any beneficial interest in those assets does not belong to the company.. The minimum specific penalty sum is 5,000 and the maximum 5,000,000. In estimating the value of the assets the liquidator must have regard to the value of the assets as disclosed in any statement of affairs, and any comments of creditors or the official receiver on that statement. If, at any time, the liquidator forms the opinion that the value of the assets is higher than the penalty sum under the current specific penalty he must obtain a further specific penalty to bring the penalty sum equal to that value (subject to the maximum limit of 5,000,000). 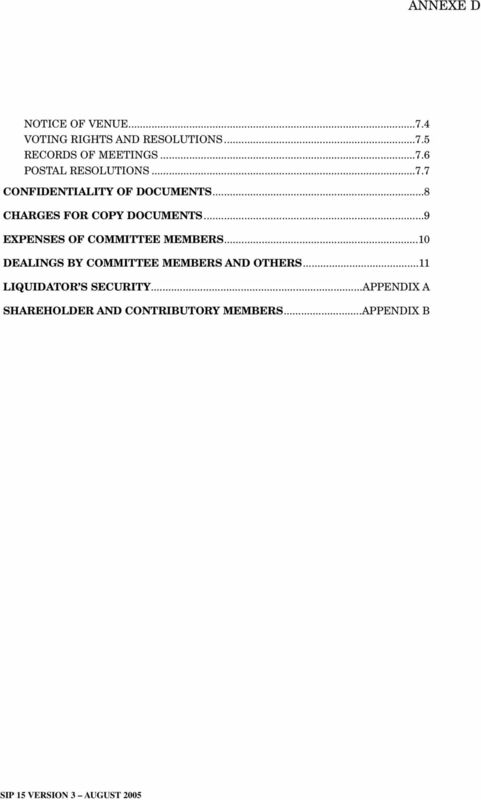 17 APPENDIX B Shareholder and Contributory Members of the Committee Where there are shareholder or contributory members of the committee the following special rules apply. References are to the section headings of the guide. The term contributory is used to refer to any contributory or shareholder member of the committee. 6.3 Resignation and Termination of Membership r A contributory member of the committee may be removed by a resolution of a meeting of contributories; 14 days notice must be given of the intention to move the resolution. 6.4 Vacancies r If there is a vacancy among the contributory members of the committee it need not be filled if the liquidator and a majority of the remaining contributory members so agree, provided that, in the case of a committee of contributory members only, the total number of members does not fall below three. The liquidator may appoint any contributory to fill the vacancy if the other contributory members agree and the contributory concerned consents to act. Alternatively, a meeting of contributories may resolve that a contributory be appointed (with his consent) to fill the vacancy. In this case at least 14 days notice must have been given of the resolution to make such an appointment. Where a meeting of contributories makes such an appointment in a creditors voluntary liquidation the creditor members of the committee may, if they think it fit, resolve that the person appointed ought not to be a member of the committee. If so - that person is not qualified to be a member of the committee unless the court directs otherwise, and on any application to the court for directions the court may appoint another contributory to fill the vacancy. 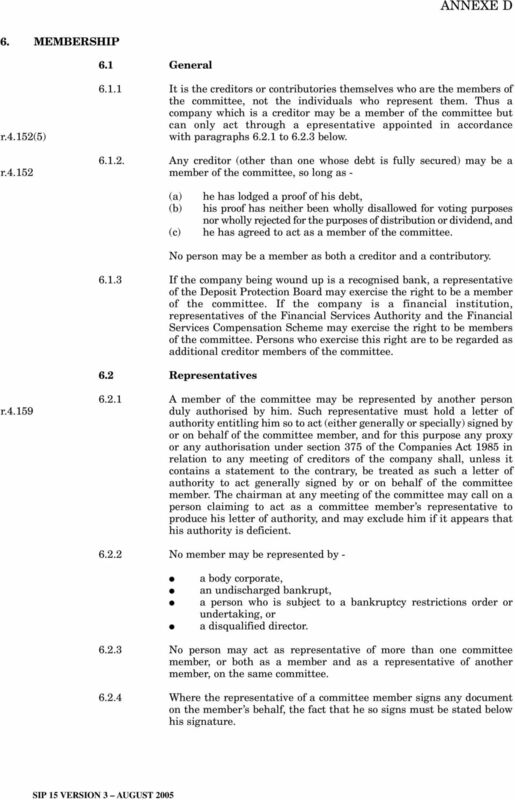 6.5 Composition of Committee when Creditors Paid in Full. r If there are at least three contributory members, the committee continues in being until a meeting of contributories decides to abolish it. If the number of contributory members is below three, the committee will cease to exist 28 days after the issue of the liquidator s certificate of payment in full; but at any time when the committee consists of less than three contributory members it is suspended and cannot act. Contributories may be co-opted by the liquidator, or appointed by a contributories meeting, to be members of the committee, up to a maximum of five members. 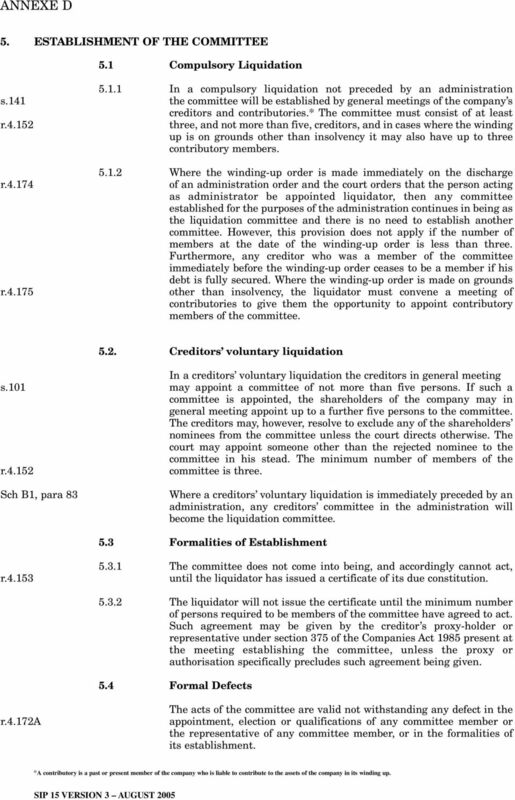 All the other rules relating to the functioning of the liquidation committee continue to apply (with necessary modifications) as if all the members of the committee were creditor members. 18 7.5 Voting Rights and Resolutions r In a compulsory liquidation, where a committee consists of both creditor and contributory members, the votes of the contributory members do not count towards the number required for passing a resolution, but the way in which they vote on any resolution must be recorded. However, where the only members of the committee are contributories, the committee is treated for voting purposes as if all its members were creditors. MASDAR CITY COMPANIES REGISTRATION REGULATIONS 2009 VERSION 3.0 11 OCTOBER 2016 CONTENTS Clause Page 1. Title... 1 2. Legislative Authority... 1 3. Interpretation... 1 4. Formation of Companies... 1 5.